Dr. Avitzur, a neurologist in private practice in Tarrytown, NY, holds academic appointments at Yale University School of Medicine AAN.com, and chair of the AAN Practice Management and Technology Subcommittee. Responses started to come in almost immediately — 60 responses since the original March 26 entry — from physicians in different specialties: neurology, infectious disease, cardiology, rheumatology, surgery, orthopedics, pathology, and, like the poster, primary care. To date, there have been almost 35,000 postings (and three million comments) on Sermo, as the community of physicians has grown to over 106,000 members with the endorsement of the American Medical Association, which joined as a partner in 2007. Among them are almost 2,700 neurologists, making it one of the largest online communities in our specialty. Sermo, which means “conversation” in Latin, is supported by fees from industry. Pharmaceutical and financial services companies — who can only read but not post entries — pay Sermo for access to physician insights through surveys and private online panels. The results give them information about what physicians are saying about the latest drugs, devices, and treatments. Adam D. Sharp, MD, one of the founders of Sermo and an emergency room physician in Indianapolis, said that Sermo set out to develop a social networking site that would never reveal the identities of its users, accept no advertising, and be provided free of charge. In fact, Dr. Conidi credits an entry on Sermo with having saved his practice from bankruptcy. All payments from his local Medicare carrier had stopped abruptly after he had moved his office despite having filed a proper change of address form. Nine months of countless phone calls and letters to the carrier failed to resolve the issue. His cash flow dwindled, forcing him to take out a home equity loan. When he turned to Sermo, he was stunned to hear that he was not alone. One physician who had had a similar experience suggested that he call his local Congressman's office. When he did, the problem was fixed immediately. “If it hadn't been for this post I would not have been able to hang on much longer and would have gone out of business,” he said. Dr. Lindenberg said Sermo provides him with a venue for teaching, which he enjoys, and would not otherwise have in private practice. Academicians are also using Sermo to network and learn new information. Jonathan B. Strober, MD, director of the Pediatric MDA Clinic at the University of California-San Francisco, used the money from the earning opportunities to purchase toys for his clinic patients' physical exams. A pediatrician on Sermo referred a patient with congenital muscular dystrophy (CMD) to him, and the child's mother turned out to be a founder of the advocacy group, Cure CMD. They have been working together ever since. He has also learned about several medications that he had otherwise not considered for off-label use. This was the case with a patient who has a mitochondrial disorder and episodic hyperglycemia. The doctors on Sermo typically select unidentifiable user names. Allan M. Block, MD, a solo practice neurologist from Scottsdale, AZ, said the anonymity allows posters to be honest. He has posted both to get and give information, and has received useful advice for queries as diverse as ideas about new practice directions, the clinical utility of botulinum toxin in different conditions, and availability of e-prescribing tools for his electronic health record. Svetlana Blitshteyn, MD, a neurologist in private practice in Amherst, NY, also appreciates the anonymity offered on Sermo. “It allows physicians to discuss topics that they would otherwise not discuss with colleagues at work: finances, personal struggles, and ethical dilemmas, for example,” she said. Critics have also raised medico-legal and ethical concerns about payment for posts, discussions of off-label use of medications, and influence from industry monitoring. “If industry is just passively listening, they're unlikely to influence users on Sermo. And if they're trying to mine data to influence practice, it would appear to be a very inefficient way of doing so,” said Daniel G. Larriviere, MD, JD, chair of the AAN Ethics, Law, and Humanities Committee. The more concerning possibility, he added, would be if neurologists who are paid by pharmaceutical companies decide to discuss off-label use of medications manufactured by their sponsoring companies. 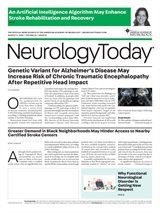 Neurology Today9(13):13-14, July 2, 2009.